FASHION DISTRICT 66 • SHOPPING CENTER BUSINESS • September 2018 To further boost the experiential component, PREIT and Macerich are currently involved in transactions with a large-footprint entertainment tenant that features bowling, Ping pong, billiards and other games as well as an artisanal Italian market with a culinary events, restaurant and retail space. AMC and the entertain- ment tenant will occupy all of the top level of the project. Other dining tenants announced in August include New York-based Dallas BBQ and Market Eats, a grab-and-go food market with access to SEPTA's Jef- ferson Station offering Chickie's & Pete's, Chick-fil-A, Oath Pizza, Burger Fi, Pei Wei, Freshii and la Madeleine. These tenants join the already open and locally-loved, Tiffany's Bakery. SEPTA is the Southeast- ern Pennsylvania Transit Authority, the city's underground rail system, that con- nects to Fashion District Philadelphia. Twenty-two million commuters per year pass through Jefferson Station, Coradino says. Retail tenants so far include H&M, Polo Ralph Lauren, Forever 21, Zumi- ez, Asics, Zales, Guess, Columbia, francesca's, Levi's and Skechers. A lease is currently being negotiated with Ulta Beauty, and Century 21 and Burlington are already open. Fashion District Philadelphia is ex- pected to activate this part of the city. It's located about one block from Reading Terminal, an indoor farmer's market in operation since 1893, and the Pennsylvania Con- vention Center and about three blocks from City Hall. The former Gal- lery Mall was de- signed with a 1970s aesthetic. 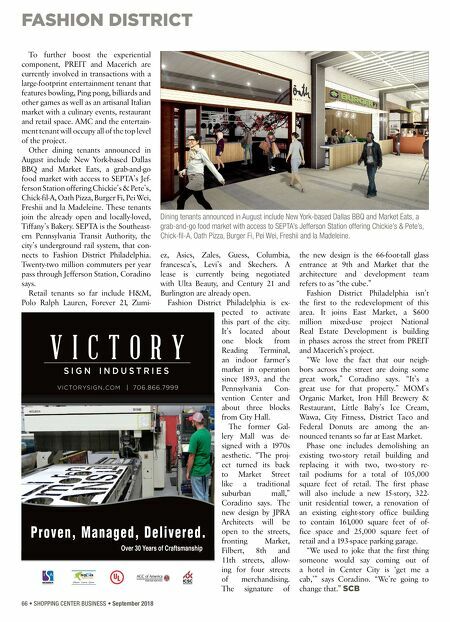 "The proj- ect turned its back to Market Street like a traditional suburban mall," Coradino says. The new design by JPRA Architects will be open to the streets, fronting Market, Filbert, 8th and 11th streets, allow- ing for four streets of merchandising. The signature of the new design is the 66-foot-tall glass entrance at 9th and Market that the architecture and development team refers to as "the cube." Fashion District Philadelphia isn't the first to the redevelopment of this area. It joins East Market, a $600 million mixed-use project National Real Estate Development is building in phases across the street from PREIT and Macerich's project. "We love the fact that our neigh- bors across the street are doing some great work," Coradino says. "It's a great use for that property." MOM's Organic Market, Iron Hill Brewery & Restaurant, Little Baby's Ice Cream, Wawa, City Fitness, District Taco and Federal Donuts are among the an- nounced tenants so far at East Market. Phase one includes demolishing an existing two-story retail building and replacing it with two, two-story re- tail podiums for a total of 105,000 square feet of retail. The first phase will also include a new 15-story, 322- unit residential tower, a renovation of an existing eight-story office building to contain 161,000 square feet of of- fice space and 25,000 square feet of retail and a 193-space parking garage. "We used to joke that the first thing someone would say coming out of a hotel in Center City is 'get me a cab,'" says Coradino. "We're going to change that." SCB Dining tenants announced in August include New York-based Dallas BBQ and Market Eats, a grab-and-go food market with access to SEPTA's Jefferson Station offering Chickie's & Pete's, Chick-fil-A, Oath Pizza, Burger Fi, Pei Wei, Freshii and la Madeleine.